Kitchens need durable, moisture-resistant flooring. The most pounded floor in the home, it needs to withstand regular staining (and therefore lots of cleaning), water spills, and temperature fluctuations. This doesn't mean that kitchen floors can't be pretty, though, and, with beautiful patterns and finishes available regardless of the material you choose, there's no excuse for your kitchen floor not to be a major part of the room's design process. Follow our guide to finding the best kitchen flooring, from choosing the right material to fitting and cleaning. For durability and a range of visual effects, nothing beats floor tiles in a kitchen. Floor tiles come in a range of natural and manmade materials and finishes, from textured to matt to high shine. Some tiles are more porous than others – something to be careful of in a room where moisture levels tend to be high. If you've fallen in love with a tile, such as terracotta, that is porous, ensure it's well sealed, and resealed regularly. Choose: Want real stone? Opt for slate or granite. For manmade materials, porcelain or ceramic tiles are a time-tested flooring option for kitchens. What's the difference? Real stone has plenty of character; manmade materials less so, although they are generally more affordable and can be made to mimic other materials convincingly, such as wood. Avoid: Limestone, which tends to scratch, and travertine, which is porous. Design know-how: Use larger-scale and/or pale-coloured and/or high-shine tiles, to make a small space feel bigger. Lay tiles diagonally rather than square on to the wall, too, to enhance the effect further. Tiles with a pitted surface are much more difficult to keep clean than those with a smooth finish. Fitting floor tiles: Is perfectly doable by DIYers, unless your floors tiles are particularly heavy and expensive, or a tricky material to cut (which some natural stones are), in which case invest in the services of a professional. Find out how to tile in our guide. Cleaning floor tiles: To clean your tiled kitchen floor, use warm water only on natural stone, and a mild detergent on ceramic and porcelain. Wood flooring brings warmth and texture to a kitchen, particularly in a period home, but importantly in a contemporary home where cabinetry might be sleek and modern. However, any kitchen will always be exposed to a lot of moisture, which means your choice of wood flooring needs to be a careful one. Choose: Engineered wood flooring, which will do much better in a kitchen – with a durable top layer, it is much more resistant to warping and movement than solid wood. Avoid: Expensive, solid wood flooring, which can warp when exposed to water. Design know-how: For an on-trend, expensive finish, have parquet flooring laid in a herringbone pattern. 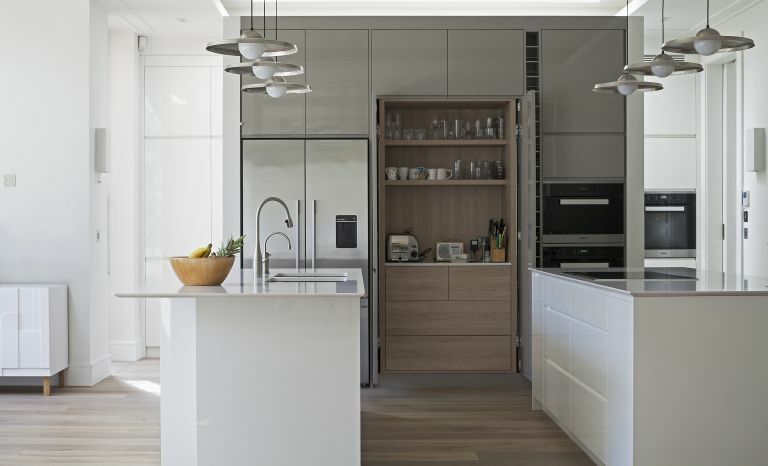 Lighter wood colours will create a more spacious feel in your kitchen, but will show dirt more quickly; white or pale cabinetry can look stunning contrasted with dark wood flooring, which hides marks more effectively. Wider boards look more contemporary than narrower ones. Fitting wood flooring: Professional fitting is often recommended for a perfect finish, but as most of the ranges now come as a floating floor with a click-lock system, competent DIYers will be able to install wood flooring themselves. Cleaning wood flooring: Clean your wood flooring with a damp mop, and avoid saturating the surface with water. Laminate flooring has been a firm favourite for kitchens for a long time. Its main edge over tile and wood flooring is its cost effectiveness, although high-quality and pricier options are available. Stain- and scratch-resistant, it's a great option for busy kitchens, but check yours copes with the room's steamy conditions before buying. Choose: Higher-end laminate, which can have a very convincing wood or tile effect, complete with grain finishes, embossing, bevelled edges and stone looks. Avoid: The cheapest laminate, which tends to stain, warp, and peel. With laminate flooring, you get what you pay for, with cheaper options often having an overly shiny and unrealistic effect. Design know-how: Go for a low-sheen finish, and look for the details mentioned above, such as bevelled edges, to get a truly convincing lookalike. Protect your laminate flooring from damage by heavy kitchen appliances with an underlay. Fitting laminate flooring: It is possible to lay most laminate flooring yourself, as most manufacturers have updated their laminate with easy-to-fit locking systems. Cleaning laminate flooring: To clean your laminate floor, use a damp cloth, but never a soaking wet mop, which can get water under the laminate flooring and ruin it. Alternative materials, such as vinyl, rubber, even bamboo, for kitchen flooring have been gaining popularity in recent years: they can be hard-wearing and water-resistant, and more cost effective than traditional options. Choose: Bamboo, which is tough, easy to maintain and more water-resistant than hardwood. Cork is another suitable option for kitchens, but is incompatible with underfloor heating. Concrete and resin flooring is a possibility for ground-floor kitchens, but will not be suitable for upstairs kitchens. Rubber can work in kitchens, but can be easily scratched, so avoid damage from kitchen appliances by placing a sheet of hardboard between the appliance and floor. Avoid: Leather and reclaimed wood, beautiful but expensive and high-maintenance materials that will not respond well to the wear and tear that is part of daily kitchen use. Design know-how: Poured concrete looks good as part of a contemporary open plan space. It can also be used outdoors, so offers the perfect opportunity to incorporate the same flooring throughout, connecting the garden to the rest of the house. Create a similar effect with floor tiles, from contemporary to traditional in style. Fitting alternative flooring: Bamboo can be fitted with glue or as a free-floating floor, and is compatible with underfloor heating (though you will need to contact your manufacturer for temperature limits). Polished concrete tiles, rubber tiles and vinyl tiles can be laid by an experienced DIYer, but poured concrete, poured resin and rubber and vinyl sheet kitchen floors should be left to professionals. Cleaning alternative flooring: Concrete, rubber, vinyl, resin and bamboo are all generally very low-maintenance and should be wipe-cleaned with a damp cloth.